Dave Brock might have been piloting spaceship Hawkwind since 1969, defining the space-rock genre along the way, but he’s been active in making music much longer than that, playing in various bands through the 1960s and working as a busker on the streets of London (and, once, at the Royal Albert Hall). Go right back to the end of the 1950s and you’d find him playing New Orleans jazz in The Gravenier Street Stompers, while if you moved into the ’60s you’d discover him hanging out with Eric Clapton at the Crawdaddy Club in Richmond. 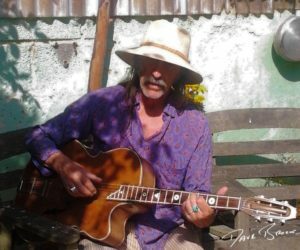 At Twickenham’s Eel Pie Island during the ’60s you’d find him playing in backing bands for such notable American blues musicians as Champion Jack Dupree or Memphis Slim, and then forming the Dharma Blues Band to play jug band music. So it might be as Chief Hawklord that he’s most recognisable, but his own musical tastes are eclectic, and inform the extended psychedelic tunes that Hawkwind are famous for. Right now he’s working on the next Hawkwind album, tentatively titled “The Machine Stops” – from the sci-fi short story by E. M. Forster – but first there’s the imminent release of his latest solo album, “Brockworld”, a follow-up to the very well-received “Looking For Love In The Lost Land Of Dreams”, released on his new Hawkward Records imprint and available from www.hawkwind.com. Dave took time out from these endeavours to chat to Louder Than War about 10 of his favourite albums, covering everything from ’50s jazz to current space-rock. You’re going to find there’s a lot of strange records here! EST is Esbjörn Svensson, piano, Dan Berglund on bass and Magnus Öström on drums. Now, poor Esbjörn Svensson died a few years ago, he was doing some deep sea diving and he died, which is a huge shame. This band were really interesting, doing modern jazz but with electronics and stuff. The drummer is doing ‘rock’ drums at times and the bass player also plays electric viola. ‘Tuesday Wonderland’ is on this one, one of their best tracks. It’s a wonderful piece of music, an exhilarating band with a wonderful rhythm section that rock along. The track that I particularly like is ‘Ice Cream’, which Kit Howard sings, an interesting record… I like New Orleans jazz. These guys playing, are really going for it. Makes you go all tingly! I met George Lewis, actually. He came over to play with Ken Colyer’s New Orleans Jazz Band. I used to go down to Ken Colyer’s Jazz Club at Leicester Square. George Lewis had a book out, a very humble man actually, a wonderful clarinet player, great style and a wonderful band, and I shook his hand and he signed his book and said, ‘this is a great pleasure.’ I said, ‘Great pleasure for me!’ What a wonderful man he was. Big Bill Broonzy was another character who came over from America, but I actually missed seeing. He was playing in London and I missed out which was a real shame, a wonderful guitarist with an individual style of playing. The track of his I particularly like here is ‘The Glory Of Love’, which is fantastic. It’s on various compilations of Big Bill Broonzy; the one I’ve got has Sonny Terry and Brownie McGhee tracks as well. But a wonderful bit of singing, wonderful guitar playing; when I first started playing the guitar I based my style on old Bill’s playing, you know? Otis Spann, of course, played with Chuck Berry and Muddy Waters, that piano playing with an individual style that we all recognise so well, and it has Robert Lockwood Jr, who was a fantastic guitar player. ‘Country Boy’, that’s a wonderful track, really interesting and great playing. Circle are a Finnish band, on the Ektro Records label, probably really hard to find. It’s very intense space-rock, really unusual, repetitive rhythms, a bit like we’d do with ‘You Shouldn’t Do That’, stuff like that, and it’s got this singer on it who has like a Spanish Flamenco style sound. I’ve got three of their albums; not everybody’s cup of tea, some of their tracks really go on, but a really interesting band. The track to listen to is called ‘Dedofiktion’, eight minutes twenty-two seconds, but if you like space-rock you’ll like this! We did a gig with them in Finland. They’re a bit like Can, in a way. Well, it’s got ‘Going To Mexico” on it, which is a great track. Good old Steve Miller! I’ve got quite a few Steve Miller records, most of his albums are really good. Another wonderful guitarist, and a great singer. ‘Voodoo Chile’, what a track. They recorded it live, didn’t they? [Did you see Jimi Hendrix at the Isle of Wight?] No, I didn’t see him there… I heard him there, because I couldn’t get in at the time, I was on the other side of the fence! [Famously, as Hawkwind played outside for free]. I never did get to see him. Had the best moments of my youth enjoying it! Circle are the only band I hadn’t heard before and it’s great! Thanks for sharing Dave.